Fans of creative, weird and funny Minor League Baseball promotions will have plenty to choose from in 2019. The Minor League Baseball season begins Thursday, with 120 teams taking the field for the first time. These 120 teams will collectively host 8,400 games in 2019. Therefore, there are 8,400 opportunities to stage an attention-getting promotion, and this doesn't even count the efforts of the 40 short-season teams that will kick off their campaigns in mid-June. While it's impossible to objectively list the "best" Minor League Baseball promotions taking place this season, this column is dedicated to taking a look at 10 that are at the very least more funny, unique and weird than most. Alternate regional food-themed identities have been all the rage in recent years, but the Curve are going in a different direction by paying homage to regional dialect instead. The Double-A Pittsburgh Pirates affiliate will play seven games as the Allegheny Yinzers, "a tribute to the familiar second-person plural pronoun 'yinz' that is commonly used by Western and Central Pennsylvania." 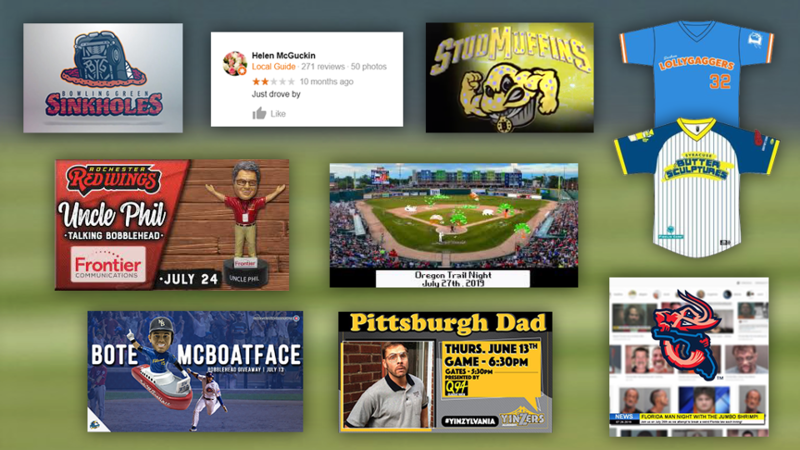 YouTube star Pittsburgh Dad, the prototypical yinzer, will be in attendance for June 13's ballgame. It'll make for an evening of ultra-specific regional humor n'at, likely including references to Primanti Bros. sandwiches, shopping at Giant Eagle and, of course, the "Stillers." The Durham Bulls are, of course, inextricably linked with the movie "Bull Durham." One of the film's most iconic bits of dialogue comes courtesy of Skip, who, during a locker room tirade, contemptuously addresses his team in the following manner: "You guys. You lollygag around the infield. You lollygag your way down to first. You lollygag in and out of the dugout. You know what that makes you?" The answer is Lollygaggers. On June 14, the Bulls will change their name to the Lollygaggers in order to "commemorate a scene still mentioned across culture today." In 2016, the Binghamton Mets announced their intent to rebrand. Six choices were presented as part of a name-the-team contest, with Rumble Ponies ultimately chosen as the winner. Stud Muffins was one of the five rejected finalists, but the name will fortunately not be relegated to the dustbin of history. Stud Muffins -- ostensibly a reference to "the collection of carousel horses belonging to Binghamtonians" -- become a reality on June 14's What If? Night. The team's uniforms sensibly depict an anthropomorphic muffin flexing his ample biceps in a menacing fashion. The only thing that could make the night better would be the presence of ultimate stud muffin Tim Tebow, who suited up for Binghamton in 2018 and is now playing for Triple-A Syracuse. If you prefer your Minor League Baseball promotions with a strong dose of unfiltered absurdity, then the RiverDogs' Helen McGuckin Night is for you. McGuckin, a Level 7 local guide on Google, gave the RiverDogs a two-star review that simply stated, "Just drove by." The RiverDogs, bemused and maybe a little irked by McGuckin's rating, are working to track McGuckin down. The Class A New York Yankees affiliate promises to produce "an unforgettable night at the ballpark that we hope ends with a new review: '5/5 would do again.'" One of the great moments in internet history occurred in 2016, when the United Kingdom's National Environmental Research Council ran an online vote to name a new vessel. "Boaty McBoatface" won the vote, and thus a recurring online joke was born. This joke moves from virtual to reality on July 13, when the Pelicans honor David Bote (a member of the team in 2012) with a "Bote McBoatface bobblehead." The bobblehead is part of the Pelicans' "Cubs-A-Palooza" weekend, which also includes an appearance by Lou Pinella. One of 2018's most memorable alternate identities came courtesy of the Syracuse Chiefs, who suited up as the Devices in homage to the Brannock Device (a foot-measuring tool invented and produced in central New York). The Chiefs are now known as the Mets, but their propensity for locally inspired one-off identities continues apace. The team, in partnership with the New York State Fair, will play as the Butter Sculptures on July 14. The name is a tribute to the state fair's massive butter sculptures, which are meticulously crafted by dairy artisans and displayed publicly to the joy and amazement of all. In addition to the Butter Sculptures uniforms, the team will also give away a butter sculpture bobblehead featuring mascot Scooch. "Uncle Phil" Salamone has worked as a Rochester Red Wings usher for 34 years, and in that time he has endeared himself to the team's fan base. The gregarious septuagenarian, known for his enthusiastic greetings and "Uncle Phil loves you!" catch phrase, will be honored with his own bobblehead on July 24. And it's not just any bobblehead, it's a talking bobblehead. "Hi everybody!" says talking bobblehead Uncle Phil. "Welcome to Frontier Field! Uncle Phil loves you!" In recent years, "Florida Man" has become a shorthand signifier for a peculiar brand of bizarre and often illegal behavior endemic to the Sunshine State. On July 26, the Jumbo Shrimp pay tribute. "We all know Florida Man or have at least seen him on the news," explains the team. "He could be tossing an alligator in a window or he could be driving a Ferrari off a pier at the behest of his savior. We know it's a weird state so let's embrace it and all its weirdness." The Jumbo Shrimp plan to break the law every inning during Florida Man Night, which is fittingly sponsored by a local lawyer. The evening also includes an appearance by noted Florida Man Lane Pitman, accomplished hurricane-defier. Last season, the Lugnuts made waves with their tribute to the video game "Backyard Baseball." Odes to pixelated '90s nostalgia continue in 2019 via July 27's "Oregon Trail" Night. The Lugnuts will give away a Daniel Norris Colonial Bobblehead as part of this pioneering evening, which is sure to include plenty of harrowing river crossings, increasingly futile hunting trips and broken-at-just-the-worst-moment wagon axles. Remember that no matter how much game you shoot, you can only bring 100 pounds back to the wagon. Five years ago, a giant sinkhole opened at Bowling Green's National Corvette Museum and swallowed up eight classic automobiles. This strange occasion is being celebrated by the Hot Rods, assumedly because time has passed and everyone can laugh about it now. On Aug. 30, the last Friday night of the season, the Hot Rods will take the field as the Sinkholes. The Sinkholes cap logo features "BG" visible on the undercarriage of a recently-swallowed automobile, while the jerseys subtly feature a stack of submerged Corvettes.